Although Quebec is widely known for its urban delights, there’s much more to see in the province beyond the city limits. Take Parc national d’Oka (www.sepaq.com/pq/oka) for example. Located just west of Montreal, this Canadian treasure offers wheelers and slow walkers the opportunity to enjoy a pristine mountain lake and even spend the night “almost” under the stars. And thanks to some recent access upgrades, this Canadian national park is now more accessible than ever. Located just 35 miles from Montreal, Parc national d’Oka (www.sepaq.com/pq/oka) is an easy 45-minute drive from the city on Highway 640 and Highway 344. If you’re coming from upstate New York, you’ll need to take the Hudson-Oka Ferry (www.traverseoka.ca), which is located about 75 miles north of the US border. The ferry runs every 15 minutes, and operates from April to November. Boarding is on a first-come basis and no reservations are accepted. The fare is $11 CAD per car, and that includes all passengers. It should be noted that they only accept cash, so make sure you have some Canadian money before you get in line. The crossing only takes a few minutes, and you don’t even get out of your car, so there’s no problem with access. After you reach Oka, turn right on Notre-Dame Street and continue along for one-and-a-half miles until you see the park entrance on your right. Once you enter the park, follow the signs to the Le Littoral Visitors Centre, which is located on the shore of Lac des Deux-Montagnes, or the Lake of Two Mountains. Named for two of the highest peaks in the area — Calvarie Mountain and Saint-Joseph-du-Lac Hill — the lake is actually part of the river delta widening of the Ottawa River, where it feeds into the St. Lawrence River. Although the lake is covered in ice in the winter, it’s the ideal spot to spend a warm summer day. There’s barrier-free access to the visitor center, with good pathway access inside. It includes a gift shop and an information desk, and it also serves as the reception desk for the huttopia tents. A restaurant with a terrace that overlooks the lake is located next door. And for a little fun on the beach, a loaner beach wheelchair is available at the information desk. Outside there’s a half-mile accessible trail that starts near the restaurant terrace. This paved trail is wide and level, and it winds through a pine forest along the lake’s edge. 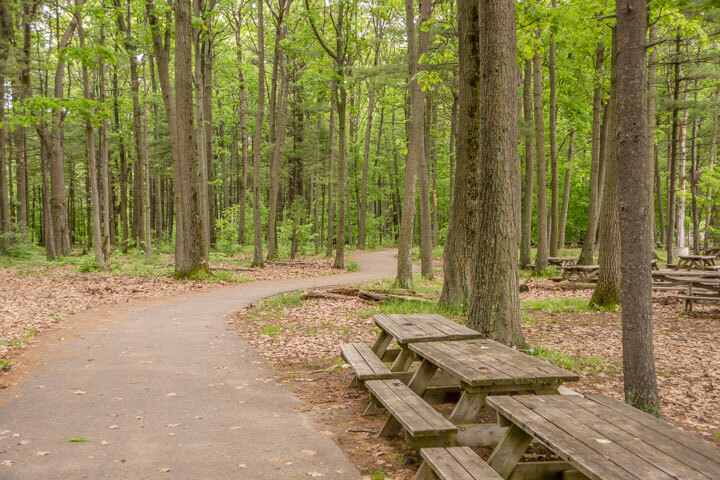 Picnic tables are located along the length of the trail, and many are easy to get to in a wheelchair. It’s just a nice stroll through the forest. There’s also a nice accessible boardwalk along the shoreline, which allows wheelchair-users direct access down to the beach. So just borrow the beach wheelchair from the visitor center and you’re good to go. 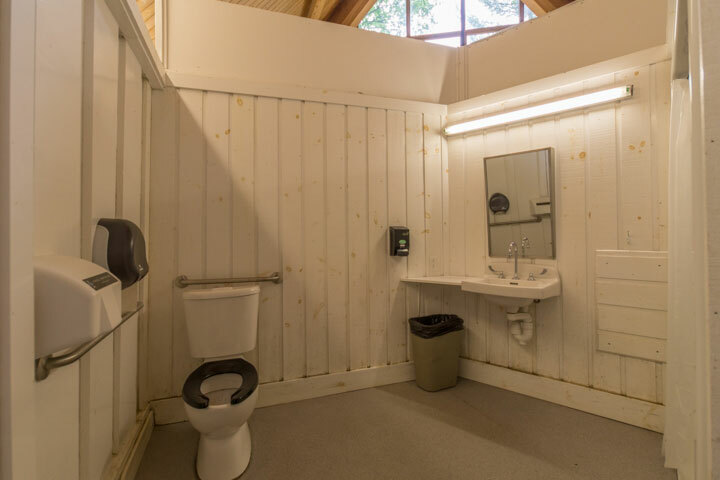 Although glamping – glamorous camping — isn’t exactly a new concept, the folks at Parc national d’Oka took it one step further and made two of their upscale huttopia tents wheelchair-accessible. 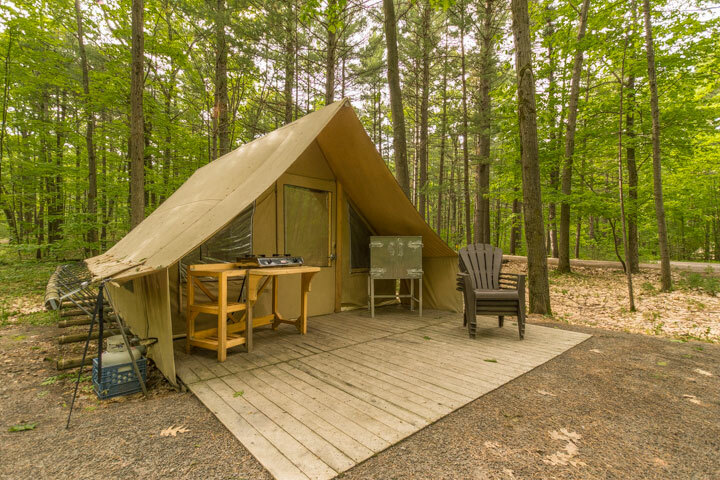 The huttopia tents are a French invention, and they have enjoyed great popularity in many of Quebec’s provincial parks. 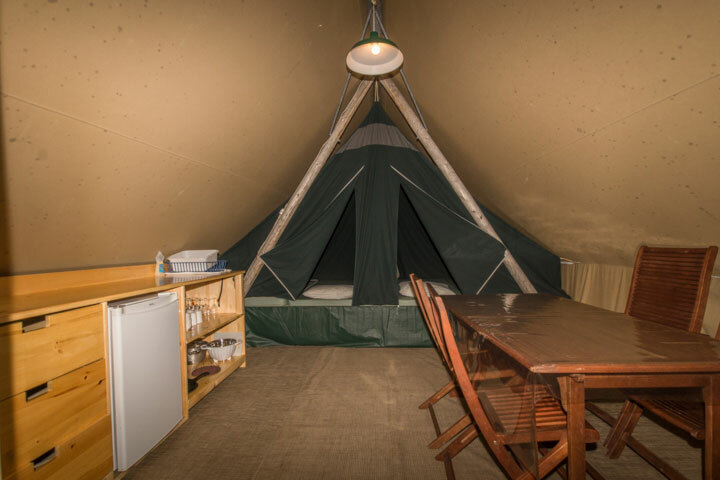 Much like the camping yurts in the US, the huttopia tents are canvas structures with wood floors, locking doors, electricity and heating. The difference lies in their shape — a yurt is round and a tent is square — and their interior configuration. Most yurts have one large room with no dividers, but the huttopia tents each have a separate “tent-within-a-tent” sleeping area. They can sleep up to four people, and if somebody wants to turn in early they can just close the inside tent flap and drift off to dreamland. Huttopia tent 150 is located next to the shower house, in Loop 4 of the Dunes Campground. There’s ample room to park in a level area in front of the tent, with level access up to the covered front porch. Inside there’s plenty of room to navigate a wheelchair around the dining table, and wheelchair-access to the 20-inch high beds that are equipped with foam mattresses. You have to bring your own bedding, but pillows are supplied. The kitchen area is outfitted with an under-counter refrigerator, and includes plenty of dishes, utensils, a skillet and a coffee pot. Outside there is an accessible bear locker and a camp stove on a wheelchair-accessible table. The tent also comes with four Adirondack chairs, an accessible picnic table and a fire ring. Truly they thought of everything — even dish soap. Huttopia tent 149, which is located next door, has the same access features. Both accessible tents come with a key to the accessible family restroom, which is located next to tent 150. 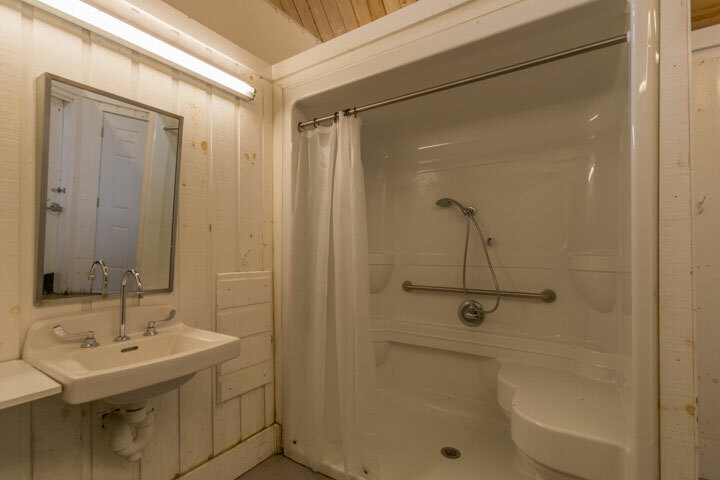 It’s equipped with a roll-in shower with grab bars, a hand-held showerhead and a built-in shower bench. The toilet grab bars are located on the right and back walls (as seated), and there’s also a roll-under sink in the restroom. It’s very well done access-wise, with plenty of room for even the largest wheelchair or scooter and an attendant. Rates for the huttopia tents start at $102 CA. It’s a fun — and accessible — way to enjoy camping without packing along a lot of equipment. Just throw your sleeping bag in the car, pick up some groceries, and you’re all set. Make plans early though, as these popular tents go fast. For more information, or to make reservations, visit https://www.sepaq.com/pq/oka/acces-universel.dot.